Todo el mundo conoce los donuts o donas (dependiendo del país en el que nos encontremos), esas deliciosas rosquillas que pueden cambiar de sabor, color, relleno, glaseado… pero que siempre tienen un agujero en medio; eso nunca cambia (a no ser que sea relleno). Algunas fuentes señalan su origen en la Edad Media en el Norte de Europa, aunque el origen más probable se encuentra en un bollo de aceite que se hacía en Holanda en el Siglo XVI, el olykoek, que era una pasta muy azucarada que se freía en grasa animal. Al principio era algo parecido a un bollo sin agujero que debido a los problemas técnicos de la época siempre quedaba crudo en el medio, ya que por su forma y tamaño era muy difícil lograr que el interior quedase completamente hecho. Para tratar de disimular este problema, se ponían nueces en esta parte central para que al haber menos masa no quedase crudo, y si quedaba crudo, el sabor de las nueces “camuflara” el sabor de la masa sin cocer. Llegaron a Estados Unidos gracias a los primeros colonos y emigrantes, y allí los empezaron a llamar “dought nut”, algo así como pasta de nueces, palabra de la que derivaría el posterior vocablo de “donut”. Pero seguía persistiendo el problema de la cocción del centro del bollo, y en 1847 un marinero, el capitán Hanson Gregory decidió hacerle un agujero en el centro usando la tapa de un pimentero, para quitar la parte de masa que siempre quedaba cruda y ver si así mejoraba la cocción, y efectivamente, así sucedió. Acababa de inventar el donut tal y como lo conocemos actualmente. Esta es la versión que contó el mismo Gregory al Washington Post en 1916 (y que puedes leer completa en inglés más abajo). Aunque algunas fuentes indican que la causa del agujero fue que no le gustaban las nueces, y otros indican que no fue él, sino su madre la creadora del agujero en el centro. Fuera como fuere, lo que está claro es que ese simple gesto de hacer un agujero en el centro de un bollo dio origen a un producto de gran éxito, hasta el punto de que existe una placa conmemorativa del evento en Rockport (Maine). 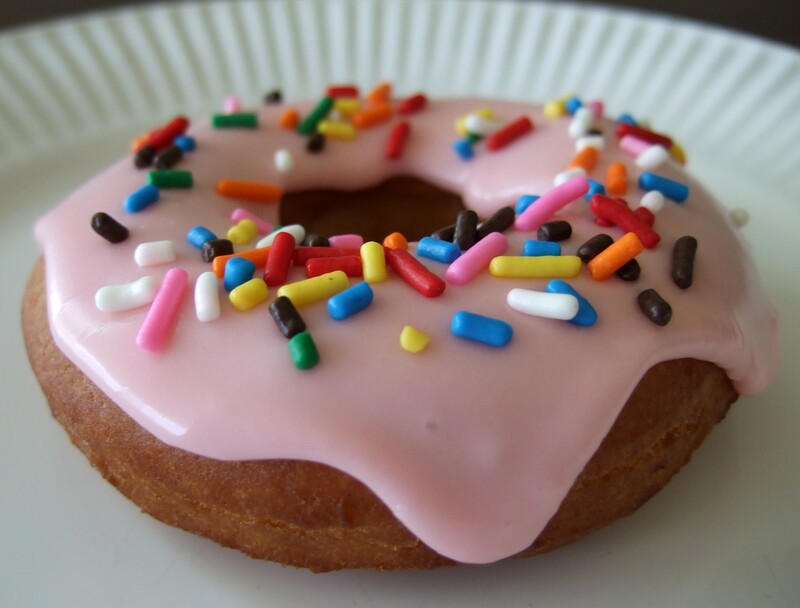 Boston, March 25.—The man who invented the hole in the doughnut has been found. He is Capt. Hanson Gregory, at present an inmate in Sailor’s Snug Harbor, at Quincy, Mass. Doughnut cutters have made fortunes for men; millions eat doughnuts for breakfast and feel satisfied. Doctors do not assail the doughnut. And all of this owes its being to Capt. Gregory, who made the doughnut a safe, sane and hygienic food. It’s a long story, mates; but as the 85-year-old chap relates it, it’s only too short. Outside the fact that Capt. Gregory is a bit hard of hearing, he’s as sound as new timber. He’s a product of Maine; and so Maine can lay claim to the discoverer of the hole in the doughnut, along with the discoverer of new ways to evade the prohibition laws. But Capt. Gregory’s discovery is of real use in the world; millions have risen, and millions more shall rise up, and call him blessed. ‘Bout ‘47 Was the Date. “It was way back—oh, I don’t know just what year—let me see—born in ‘31, shipped when I was 13—well, I guess it was about ‘47, when I was 16, that I was aboard ship and discovered the hole which was later to revolutionize the doughnut industry. “I first shipped aboard the Isaac Achorn, three-masted schooner, Capt. Rhodes, in the lime trade. Later I joined other crews and other captains, and it was on one of these cruises that I was mawing doughnuts. “Pretty d—d tough, too!” profanely agreed one of the dozen pipe-smoking fellows who were all eyes and ears, taking in their comrade’s interview by The Post reporter. “Well, I says to myself, ‘Why wouldn’t a space inside solve the difficulty?’ I thought at first I’d take one of the strips (Col. 2—ed.) and roll it around, then I got an inspiration, a great inspiration. “Was Columbus pleased? Well, sir, them doughnuts was the finest I ever tasted. No more indigestion—no more greasy sinkers—but just well-done, fried-through doughnuts. “That cruise over, I went home to my old mother and father in Camden, Me., where I was born. My father, Hanson Gregory, sr., lived to be 93, and my mother lived to be 79. She was a pretty old lady then. I saw her making doughnuts in the kitchen—I can see her now, and as fine a woman as ever-lived, was my mother. “I says to her: ‘Let me make some doughnuts for you.’ She says all right, so I made her one or two and then showed her how. “She then made several panfuls and sent them down to Rockland, just outside Camden. Everybody was delighted and they never made doughnuts any other way except the way I showed my mother. “Well, I never took out a patent on it; I don’t suppose any one can patent anything he discovers; I don’t suppose Peary could patent the north pole or Columbus patent America. But I thought I’d get out a doughnut cutter—but somebody got in ahead of me. Hole “Cut Out,” His Joke. “Of course a hole ain’t so much; but it’s the best part of the doughnut--you’d think so if you had ever tasted the doughnuts we used to eat in ‘31. Of course, lots of people joke about the hole in the doughnut. I’ve got a joke myself: Whenever anybody says to me: ‘Where’s the hole in the doughnut?’ I always answer: ‘It’s been cut out!’” and the old chap laughed loud and longat his little sally, while the rest joined in. “The hole’s been cut out, I guess!” to the delight of the whole shipful.